How do people perceive information? 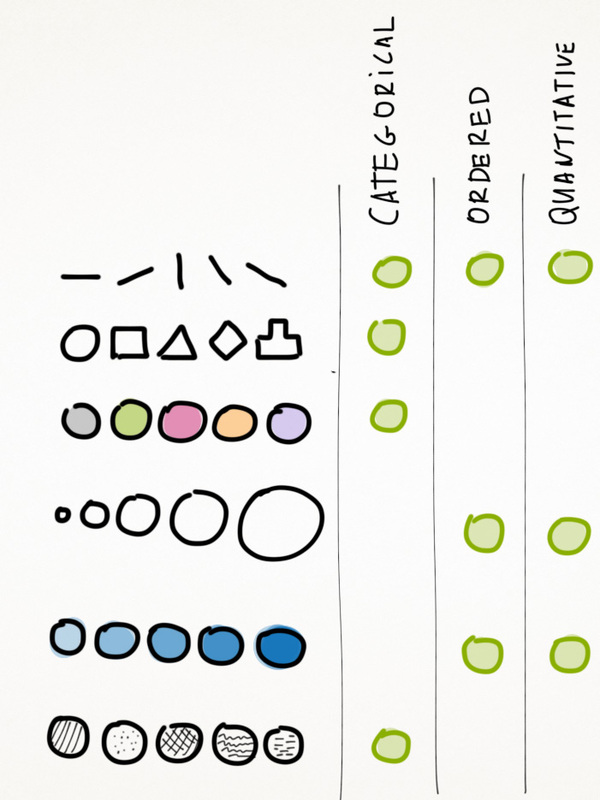 How designers can thrive on this process to help people understand data faster? Let's try to look into this complex field and explore some basic principles. The visual encoding is the way in which data is mapped into visual structures, upon which we build the images on a screen. There are two types of visual encoding variables: planar and retinal. Humans are sensitive to the retinal variables. They easily differentiate between various colors, shapes, sizes and other properties. Retinal variables were introduced by Bertin (→) about 40 years ago, and this concept has become quite popular recently. While there's some critique about the effectiveness of retinal variables (→), most specialists find them useful. The goal of this article is to provide an engaging introduction to visual encoding, and to give some hands-on examples of how it helps to present data in a meaningful way. Anything that has exact numbers. For example, Effort in points: 0, 1, 2, 3, 5, 8, 13. Duration in days: 1, 4, 666. Anything that can be compared and ordered. 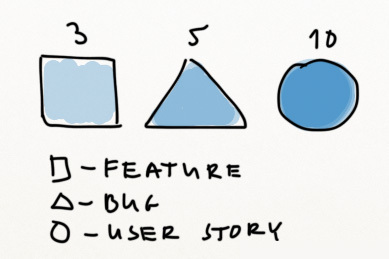 User Story Priority: Must Have, Great, Good, Not Sure. Bug Severity: Blocking, Average, Who Cares. Entity types: Bugs, Stories, Features, Test Cases. OK, we've got some data. Now how do we present it? We have several visual encoding variables. Planar variables are known to everybody. If you've studied maths (which I'm sure you'd have), you've beed drawing graphs across the X- and Y-axis. Planar variables work for any data type. They work great to present any quantitative data. It's a pity that we have to deal wuth the flat screens and just two planar variables. Well, we can try to use Z-axis, but 3D charts look horrible on screen in 95.8% of cases. So what should we do then to present three or more variables? We can use the retinal variables! We know that size does matter. You can see the difference right away. Small is innocuous, large isdangerous perhaps. Size is a good visualizer for the quantitative data. Texture is less common. You can't touch it on screen, and it's usually less catchy than color. So, in theory texture can be used for soft encoding, but in practice it's better to pass on it. Round circles ○, edgy stars ☆, solid rectangles █. We can easily distinguish dozens of shapes. They do work well sometimes for the visual encoding of categories. While we're able to clearly identify vertical vs. horizontal lines, it is harder to use it properly for visual encoding. Any color value can be moved over a scale. Greyscale is a good example. While we can't be certain that#999 color is lighter than #888, still it's a helpful technique to visualize the ordered data. Red color is alarming. Green color is calm. Blue color is peaceful. Colors are great to separate categories. 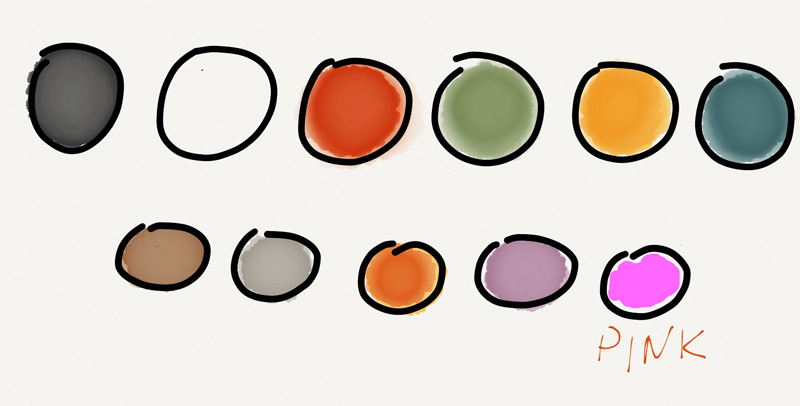 Color is the most interesting variable, let's dig into some details here. There are three different scales that we can use with color. We've already mentioned two of them: the categorical scale (color hue) and the sequential scale (color value). Diverging scale is somewhat new. It encodes positive and negative values, e.g. temperatures in range of -50 to +50 C. It would be a mistake to use any other color scales for that. How to Apply the Retinal Variables to Data? It is quite clear that we can't use all variables to present any data types. For example, it is wrong to usecolor to represent numbers (1, 2, 3). And it is bad to use size to represent various currencies (€, £ , ¥). Why on Earth should small circles stand for euro, and large circles for pounds? Note that planar variables can be applied to all the data types. Indeed, we can use the X-axis for categories, ordered variables or numbers. In theory, you can mix these variables as you wish. I'm going to try four combinations. Hmm, looks like a puzzle. Value doesn't work for the quantitative data, it seems. Let's try something else! Well, slightly better. The color coding works for entity types. For example, in TargetProcess we've got green Features, red Bugs and blue User Stories. Still not very good. Almost great. But why this legend with texture? Can we just remove it? Yes! Let's use the X and Y planar variables. Now we have the best result! It turned out that X+Y works great for a simple data set with just two variables. So, there's no need to use retinal variables at all. Retinal variables should be used if you need to present three or more data sources. 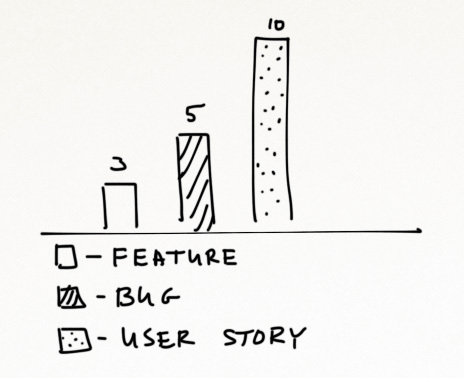 Bugs are usually are smaller than user stories, and features are the largest entities. Important bugs are small and get fixed quickly. 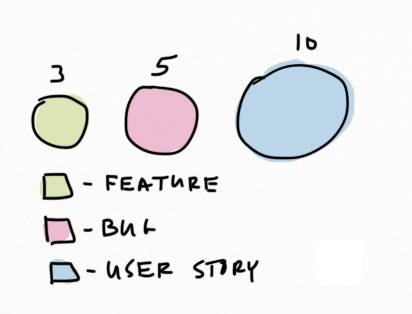 Important features are the largest, and it takes more time to release them (interesting information, by the way!). Unimportant bugs are the largest, and it takes longer to fix them. There's a good correlation between effort and cycle time: it takes more time to deliver large entities. Of course, you can get the same info from the plain table above, but the chart is much more fun to explore. Let's check some real-life examples to get an even better idea of what visual encoding is about. All these examples are related to sports. This chart is fun to explore. We can see right away that the Rays are doing fantastic as well as San Diego and Texas, while Chicago has some problems. It would be great to be able to focus on the blue or red teams only, this visualization lacks some interactivity. A very complex and somewhat crazy example where all the retinal variables are used: the shoes wall. Take a look at those diverse visualizations. The concept can be quite hard to grasp, but it's curiosity that should be driving us to explore. The encoding variables power clear and intelligent visualizations when used wisely. Avoid common mistakes, identify your data types and pick the relevant variables.